Flude Commercial is an independent, regional firm of Chartered Surveyors specialising in the provision of advice to those with commercial property interests. We are a hard working firm who understand business and are highly experienced in what we do. With offices in Sussex and a strong network of contacts in London, we work closely with our clients to find practical solutions to match their requirements and to maximise their property opportunities. Callum holds a BA (Hons) in Geography, and an MSc. in Property Development from the University of Portsmouth. 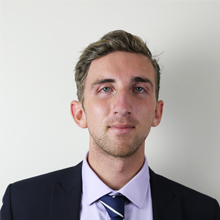 Callum currently works within the firm’s Professional Department, undertaking rent reviews and lease renewals, and assisting in the preparation of valuation reports. He aims to shortly complete his Assessment of Professional Competence, with the aim to qualify as a Chartered Valuation Surveyor. Callum's contact details are - email: cwoodgate@flude.com, telephone: 01243 819000. Matthew Le Seelleur, BA(Hons), MBA, MRICS, MCMI has 22 years' experience working in Professional Services and is currently working at Flude Commercial, a Chartered Surveyors and Commercial Property Advisers, located in Chichester.